In Article " Electrical Wiring Diagrams for Air Conditioning Systems – Part Two ", I explained the electrical wiring diagrams for some Typical Air conditioning equipments. Today, I will explain Electrical Wiring Diagrams for other Typical Air-Conditioning Equipment. A heating, ventilating and air-conditioning (HVAC) system is a simple system of heating and cooling exchangers using water or refrigerant (direct expansion system) as the medium. Pumps move the heated or cooled water to the exchangers. Fans then move the warmed or cooled air created at the exchangers to the occupied building interiors. Air stage: air is the medium for heat exchange in the building as it can be cooled or heated through coils. Fans: for air circulation and ventilation. Chillers: for the production of chilled water for large buildings (note: for small buildings use the direct expansion cooling systems such as packaged air-conditioners). Boilers: for the production of hot water for Heating (note: it is often to use the electric heaters for zonal reheat). Pumps: for the circulation of heating hot water, chilled water and condenser water. Cooling towers: for heat rejection. The primary energy use is the cooling tower fan and pumps. 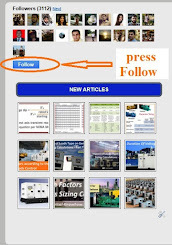 Controls: coordinate the operation of the mechanical components together as a system. A chiller is a mechanical refrigeration device, like an air conditioner, except that it cools a fluid (usually water) instead of cooling air. When a large air conditioner is required it is sometimes more feasible to use one large chiller instead of many small air conditioners. Chillers are also used wherever there is a need for cooling a fluid such as a chemical process or for plastics molding. To simplify the concept of a chiller you should compare it to a drinking fountain where you get cold “chilled” water. There are a variety of water chiller types (see Fig.2). Most commonly, they are absorption, centrifugal, helical rotary, and scroll. Some reciprocating chillers are also available. For more information about Chillers and their types, please review Article " HVAC Systems Main Equipment ". It can be either air-cooled, a coil or coils and a fan or fans, or water-cooled, another shell & tube heat exchanger cooled by cooling tower or other water. A type of condenser where refrigerant flows through the tubes and rejects heat into a flow of ambient air, most chiller units are fitted with air cooled condensers. A type of chiller condenser that uses water to remove heat from the refrigerant, this is normally a shell & tube type design. A type of expansion device typically fitted on small capacity hire chillers, it comprises a long tube which reduces the pressure of the refrigerant. Centrifugal Fan – A type of fan fitted to an air cooled chiller allowing the fitting of ductwork onto the hot side of an air cooled condenser. The fan is designed to work against a static pressure. The main component in a chiller system, the compressor is used to increase the pressure & temperature of the refrigerant vapour. Compressors are usually reciprocating, scroll, centrifugal, or rotary screw types. The part of a chiller system where the refrigerant vapour is converted to liquid as it rejects heat. A device used to supply uniform gas supply through a submerged coil in a tank chiller evaporator. The part of the chiller system where cool liquid refrigerant absorbs heat from the chilled water circuit. It is usually of shell & tube constructions and is the exchanger where chilled water would be produced. A device used to maintain the pressure difference between the high pressure & low pressure sides of the chiller system. A device installed at the discharge side of the chiller compressor to reduce noise and vibration in reciprocating compressors. A device installed in the liquid line to remove moisture and foreign matter, designed to protect the chillers compressor. It is used to isolate one part of the chiller system from the rest. It is the lower portion of the chillers condenser that further cools the saturated liquid refrigerant. Cabinet is made from heavy gauge galvanized steel. Steel sheet panels are zinc coated and galvanized by hot dip process followed by air dry paint or backed on electrostatic polyester dry powder coat. The control panel design is equivalent to NEMA 4 (IP55) with hinged door for easy access ensuring dust and weatherproof construction. Internal power and control wiring is neatly routed, adequately anchored and all wires identified with cable markers as per standards applicable to HVAC industry. 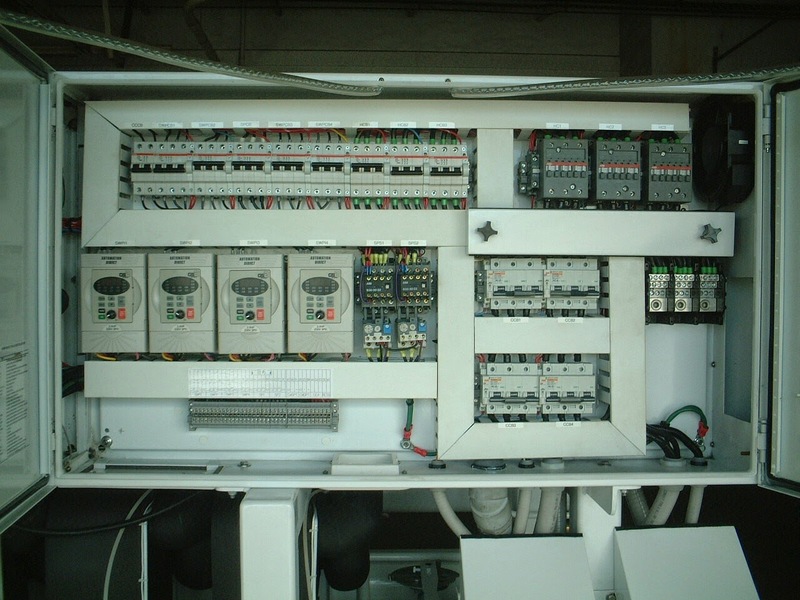 The electrical controls, used in the control panel, must be reliable in operation at high ambient conditions for a long period. Let’s take an example for Water Chillers like Air cooled screw water chillers from Cooline Co. model # ASQ115B, the following electrical data for this model will be as in Fig.5. 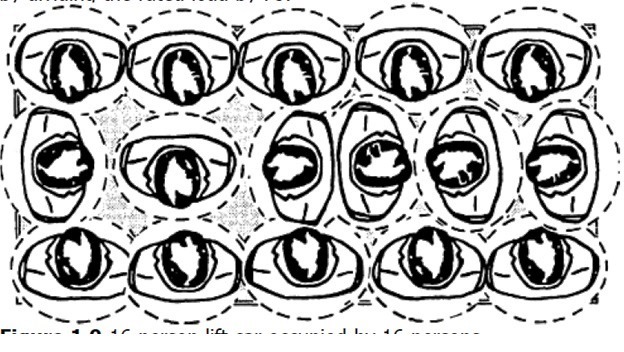 The model drawing and main components are indicated as in Fig.6. And a Typical Schematic Wiring Diagram (Part Winding Start) for this model is indicated in Fig.7. the number of compressors = 2.
the number of condenser fans = 8. 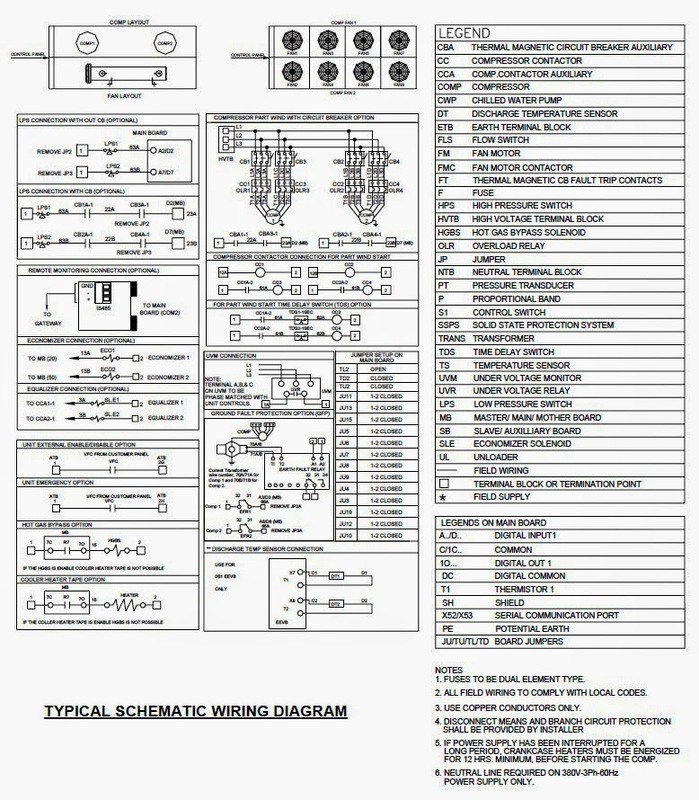 Also, the Legend, Notes & wiring diagram for optional items used for this model is indicated in Fig.8. Field power wiring is a single point connection; Main 3 phase power must be supplied from a single field supplied and mounted Disconnect switch, using dual element time delay fuse or circuit breaker with Rating as recommended by manufacturer. Also, electrical lugs for incoming power are provided by manufacturer. Interlocking connections are needed with water flow switch, pumps, remote monitoring system and two barrel units water temperature sensor, if any. If you will use DOL starters (see Fig.10), you must install a separate Disconnect switch, using dual element time delay fuse or circuit breaker (see Fig.11) with Rating as recommended by manufacturer. And if you use VFD which you must install a separate Disconnect switch, using dual element time delay fuse or circuit breaker (see Fig.11) with Rating as recommended by manufacturer. But if you use DOL combination starters (see Fig.12) which come with a Disconnect switch or circuit breaker built in the unit (see Fig.13). This will eliminate the cost of wiring between separate disconnect means and starters. In the next Article, I will explain in detail Different Types, Locations and Sizes of Disconnecting Means used for HVAC Systems. So, please keep following. a very good reviewer of my technical knowledge in electrical wiring for air conditioning system.